Because the size of the combined (x86 + x64) image from tryamya language interface exceeded DVD5, created two different ways: individually and separately x86 - x64. Compensating for the need to use two discs instead of one can assume that in this case, we do not lose (for one of the architectures) the possibility to use System Restore from the installation disk. DG Win & Soft adheres to the idea that the place must necessarily original images. 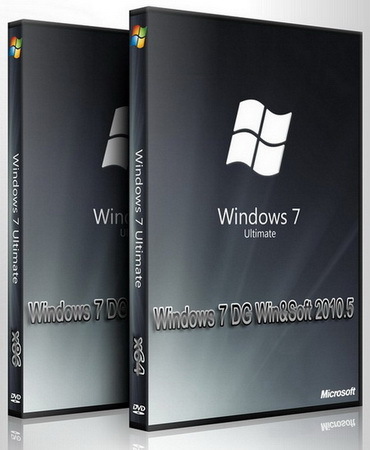 But the trouble is that a complete set of all editions of Windows 7 takes a lot of space. Since Microsoft allows regular means (using the Windows Automated Installation Kit for Windows 7 and Windows Server 2008 R2) to combine different version of Windows 7 in one image and integirovat it released updates, it was decided to do just that. After installation, you will have the original version of Windows 7 (changed only the background image and added 2 shortcut on your desktop, then read more and see the screenshots) to officially go out updates as of 14.04.2010. All editions can be installed with English, Russian or Ukrainian interface, while in the Enterprise and Ultimate editions immediately integrated into two additional languages and have the opportunity for them to switch.